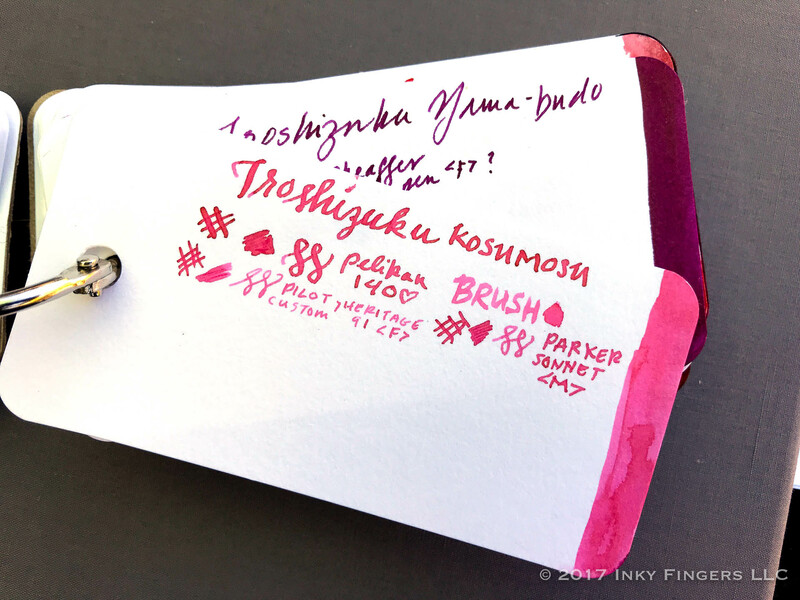 Pilot Iroshizuku Kosumosu is a bright pink ink, and it is also a delicate and sophisticated pink. 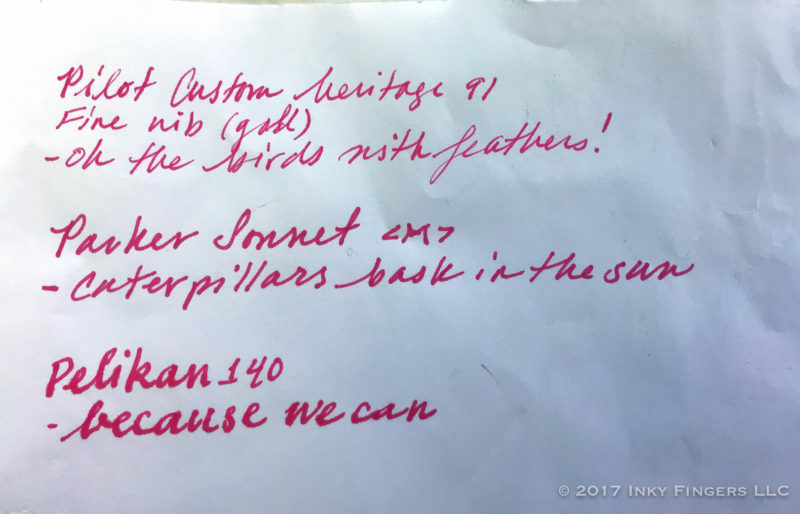 During my recent attendance at the San Francisco Pen Show, one of my ink wishes was to find a great pink ink. Not normally being a pink ink person, I wanted to branch out of my dark and saturated ink comfort zone and find an interesting and cheerful color. And she did! 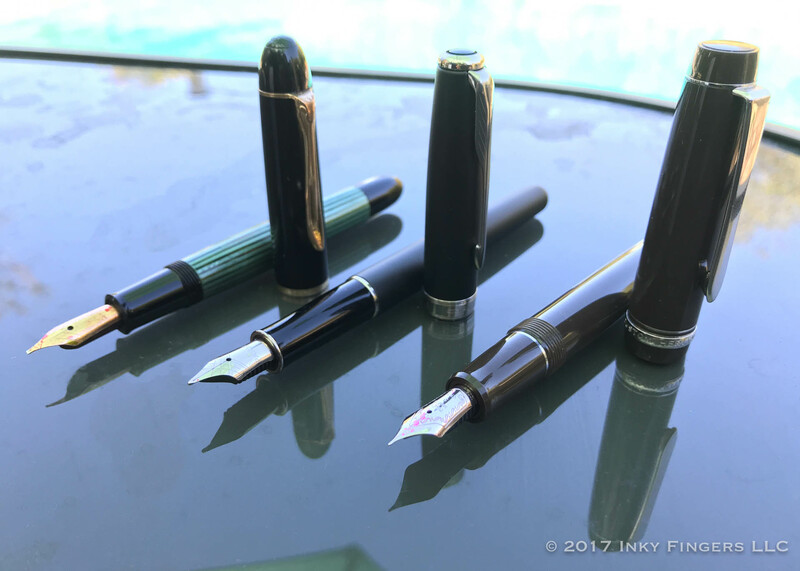 For my fountain pen tests, I have gone to my “Three P’s” of fountain pens, Pilot, Parker, and Pelikan. 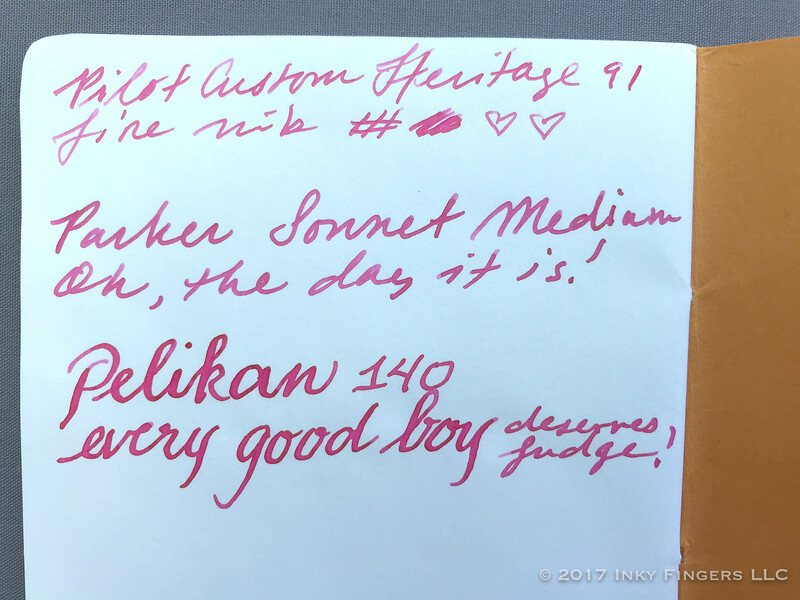 My Pilot Custom Heritage 91 with a fine gold nib, has a lovely and consistent extra-fine line. Parker Sonnet with medium steel nib, which could be considered broad depending on your frame of reference, a solid writer. 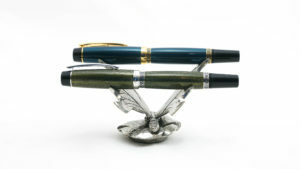 And for the fancy one, I brought out my beloved vintage Pelikan 140 with its’ magical 14K semi-flex nib. The ink flowed nicely through all nibs, for short and longer writing sessions equally well. The color brightens up my daily planner and writes a cheerful letter. It is exuberant on birthday cards! It might be too cheerful for work notes—this is not a serious-minded color. Overall, I found it to be saturated in a wet nib, and shades nicely in nibs with a more moderate flow. There is some sheen to be seen when it pools, but this is not very noticeable for regular writing. Mostly the sheen is there on blorps and blops. One thing I really liked about it was how different the color appears depending on the delivery system. But Kosumosu is surprisingly particular about paper, as I discovered. No real feathering, as expected. 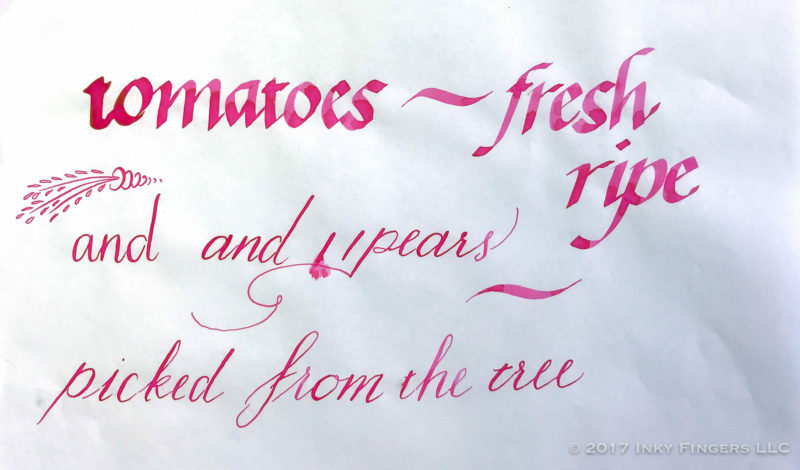 Shading all around, and color varies from the bright saturated pink in the Pelikan flex to the delicate sophisticated pink line in the Pilot fine. The Parker medium sits in the middle of the two, less shading and less bright, but consistent. 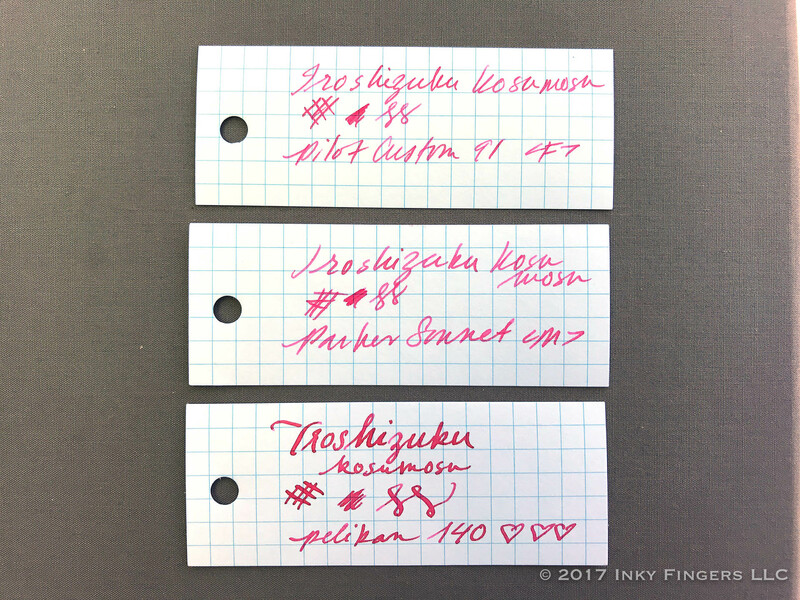 Slight show through for all three and the Pelikan sample bled through a little bit. No feathering, bleed or show-through. Not so much shading and ink color appear more consistent across all nibs. 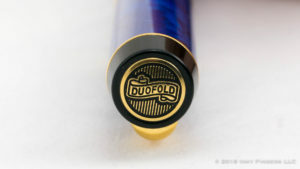 So often the best case scenario for fountain pen inks, and here we have no exception. Each nib brings out its own character in the ink, with more shading in the pilot fine nib than either the Parker medium or Pelikan flex. Nicely readable for all, and the wettest nib gets that little outline around it. Here we can really see the color variety possible! Finer lines and brushwork show almost a baby pink color, whereas wetter, bolder nibs approach a salmon or light coral hue. 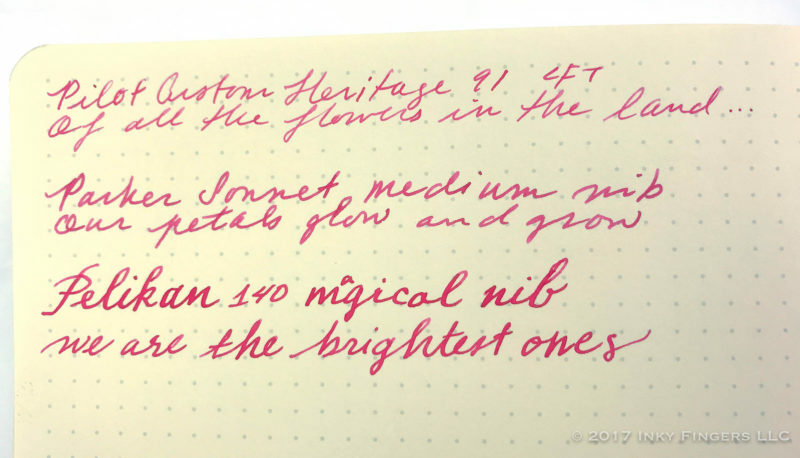 Some sheen is evident from the Pelikan nib, and there is even some shading in the brush-applied swatch. No feathering and very little show-through. A smidge of bleed from the Pelikan nib. Not seeing sheen but much shading all around. The medium and fine nibs appear lighter in general than other papers. Nicely saturated, we get the salmon-y shade on this off-white paper. No feathering or bleed, very slight show-through. Some outlining on the Pelikan nib too! Loving the variety of tones evident in these three examples. I swear to you, this example really is copy paper and not a paper towel! Crazy feathering, you can practically feel it happening as you write. All show-through, all the time. Bled through to the paper underneath. If you want to mark-up this kind of paper with pink ink, I’d go felt tip. For my art test, I used Strathmore cold-press watercolor paper and a Princeton Velvetouch™ Long Round #8 brush. 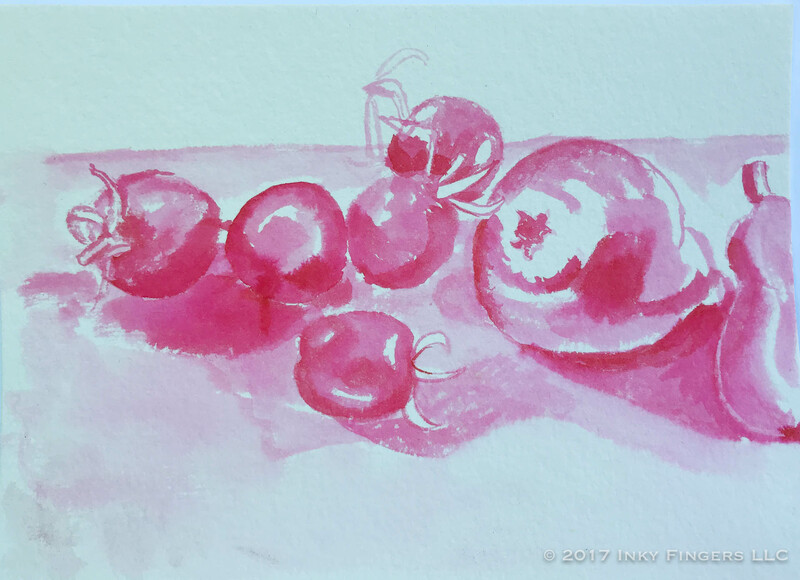 Collecting bounty from the garden, I wanted to see if there would be enough variety of shading from this bright color ink to render the subtle forms of tomatoes and pears in diffuse light. I used a careful methodology and also went for it with my brush loaded down with ink. I was impressed by the range of tones and the ability to create a sense of depth. My best results were achieved by drawing a light outline with the tip of the brush and mixing with water to build depth gradually with thin layers of color. If I were to transform this ink test into a finished artwork, I would deepen the shadows with a transparent and desaturated violet. And maybe add very light ornamental wallpaper. (Maybe). 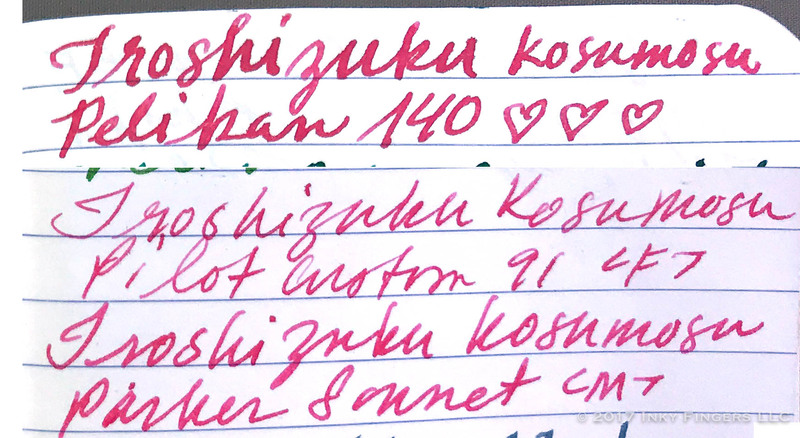 Once again the ink showed me how much it prefers a smooth paper— as you can see from my preliminary strokes with dip nibs on Soho Sketch paper, the Kosumosu wants to feather, whereas the marks made with Pelikan Brilliant Brown and a kuretake brush pen hold up much better. But happily, that was just my test sheet. I used a loose sheet of white Tomoe River paper for calligraphy practice. Oh, the color is lovely! The thin sheet of paper often moved along with my nibs, so please forgive the awkward strokes and wobbly slants. In the speedball C-1 nib, it took a lot of extra writing to get this thin ink to a level that could show off crisp lines. And oh, the shading when this happens! Sophisticated, subtle, undeniably pretty. I just wanted to keep making italic letters, and happily one can write many without re-dipping the pen with this broad nib. The first two letters were still pretty gloppy, but as a consolation prize, there is some sheen there in the right light. Actually, you can see that sheen in dim light too!Fitting a zebra G into my oblique holder, I transferred some ink into a small, shallow container so that my nib could “drink”. I dipped the nib several times with the flex writing; perhaps if I were to make a longer finished piece of writing I would thicken the ink a little bit. But aside from that and the paper moving around underneath my nib, I really like the saturation and shading one can get. Fitting a Zebra G into my oblique holder, I transferred some ink into a small, shallow container so that my nib could “drink”. I dipped the nib several times with the flex writing; perhaps if I were to make a longer finished piece of writing I would thicken the ink a little bit. But aside from that and the paper moving around underneath my nib, I really like the saturation and shading one can get. Of course, once it starts shading, you know you’ll be dipping again soon. But: dip nibs. That’s what you do! So then. I really love this ink. It was enjoyable in all applications. Maybe least enjoyable with the Zebra G, but I still enjoyed it, after all. 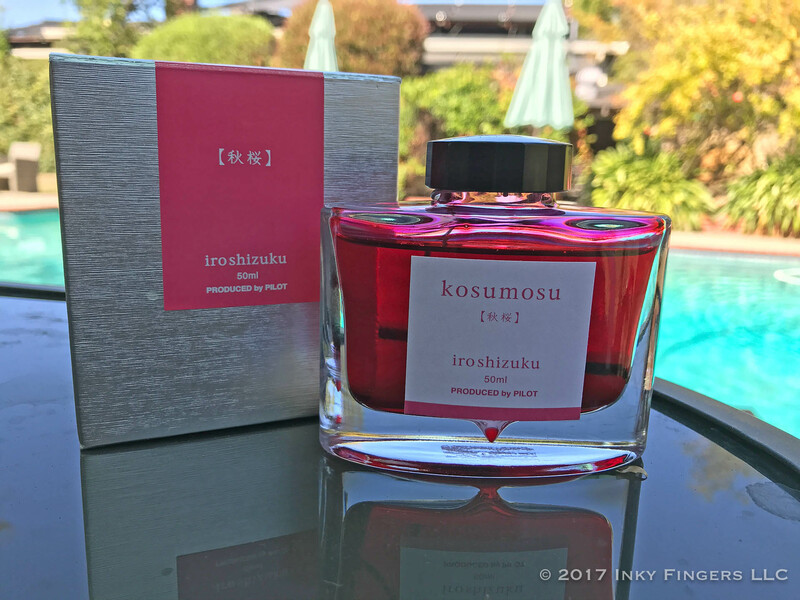 I highly recommend Kosumosu for those who would like to write a cheerful letter, or send an enthusiastic card, or to brighten their day bit by bit in the Hobonichi planner. For those who do not often write on fancy fountain pen friendly paper, I would say this ink is not the best choice. 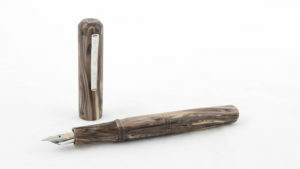 Regardless, I will be happily inking up many pens with this in the future. Julia van der Wyk is an artist, classical musician, and lover of the outdoors. During business hours she is a front-end web developer. 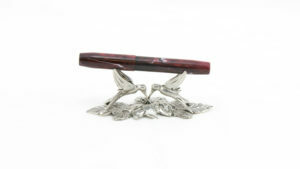 She resides in Santa Cruz, California, where she can draw Pelicans with Pelikans. Her (mostly) daily drawing is posted to Twitter and Instagram as @juliavdw. Welcome to Season 5! Plus a Mailbag!